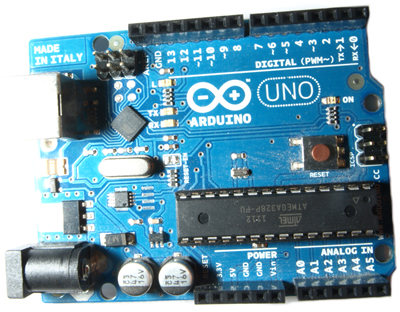 Arduino is described as an open-source electronics prototyping platform based on flexible, easy-to-use hardware and software. It's intended for artists, designers, hobbyists, and anyone interested in creating interactive objects or environments. The concept is not new no but the clever and simple way in which this package has been manufactured puts it in a league of its own compared to pervious platforms available for the hobbyist and designer. In the past if you wanted to make electronic projects you would have to build dedicated circuits to achieve specific functions such as controlling a motor or switching some lights. You could buy kits to achieve these functions but the major drawback is they only did what they were designed to do. If your project required a processor then you would probably use a PIC microcontroller but you would have to build the circuit yourself and you would also need a programmer to program the processor. All very expensive and complicated. Arduino takes a powerful mini processor and places it on a circuit board which contains all the necessary circuitry for easy programming and interfacing. In this simple and compact form it truly allows for designers with minimal technical knowledge to bring their projects alive. Opening up the small cigarette sized packet it arrived in I was amazed at its small size, it fits easily in the palm of your hand. To get working all you need to do is plug in a standard USB lead between it and your computer. This is used for programming and provides the board with power. The Arduino comes with a pre installed test program that blinks an on board led. Once it is plugged in and powered up the program runs and the LED blinks. The programming tool is free to download from the manufactures website and comes with a good number of example programs to get the feel of how it works. The programming language is very easy to learn and use. Well this is where the Arduino comes into a league of its own. There are available a vast number of what they term “Shields”, these plug directly on top of the Arduino processor board connecting with all the necessary input output and control signals. Shields are available to connect to networks using LAN, WiFi or Bluetooth, there are dedicated motor controllers, expandable input output shields and even touch screen displays. If you can’t find a shield to do what you want then you can easily make one. But remember a shield is just a temporary form of defense! Straight away I was excited by the possibilities of my new toy and the projects I can now make with it. I have not experimented with electronics for some time but what it has made me realize is how electronics has advanced. While researching sensors that I could connect to the Arduino I discovered that there are now a range of input sensors that just require three connections to work. A microphone complete with amplifier, smaller than a penny just requires a supply voltage and sound output connections. A distance sensor again juts three wires, the supply and the output signal. Its output signal is proportional to the distance so programming is simplicity in itself. Most attachable devices have data and programming examples on the manufactures websites. Thanks for this article Brian. It gives artists like me a great insight as to what is possible.